New seasons means new roundups! 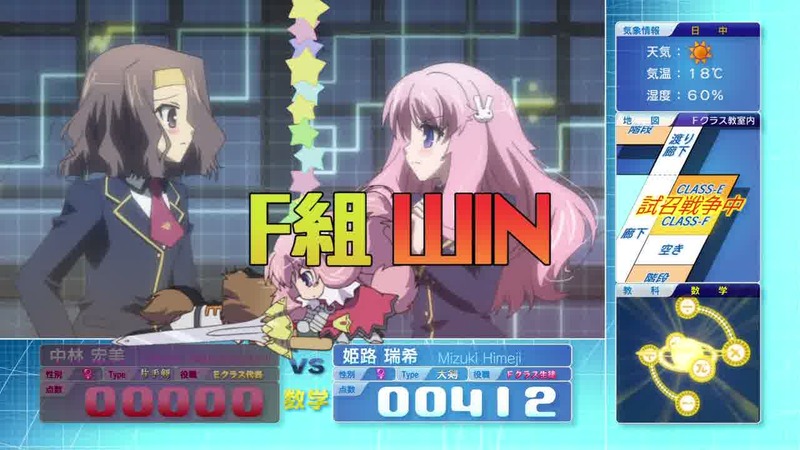 Today, we cover Ladies vs Butlers, Baka to Test to Shokanju, Durarara! !, and Ookamikakushi. The slim hopes that this would be some kind of battle royale fighting anime between overpowered butlers and even more overpowered maids were not realized, as you can see above. The only thing I have to say about this show is that, given its subject matter, both its pacing and its plot were rather…limp. In more ways than one. A surprise, given its intent. At least Kanokon tried hard. Now this one has pep, if not much else. In a way this is a standard fighting anime, complete with actual RPG-like stats and avatars somewhat reminiscent of Angelic Layer. The concept of an entire class challenging another to a duel is handled well, with enough of a mix of archetypal characters and fast-flowing humor that its essential predictability goes down easy. (As Ray points out, it’s not quite a standard harem situation.) 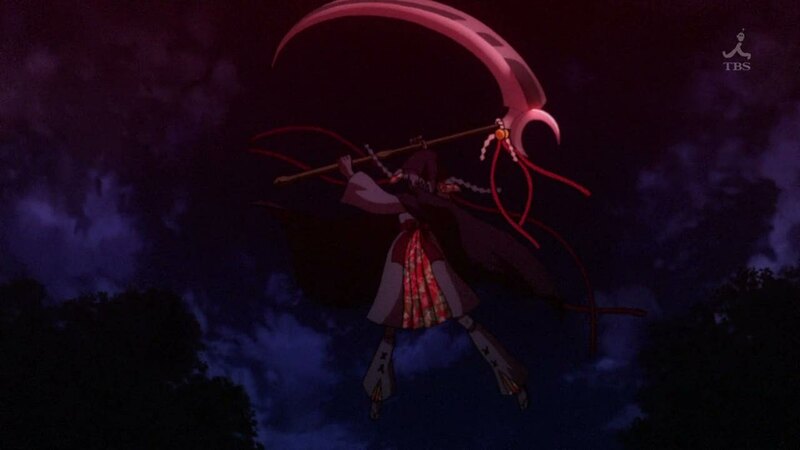 For me, at least, very over-the-top slapstick can help carry a show–what other people called overdone in a show like Seto no Hanayome I called funny, and this one fits the bill as a decent “easy watch.” I laughed several times, and that’s what counts. Watch Spice and Wolf. All the cool kids are doing it. This was probably the most anticipated show of the winter for many people, since it comes from the creators of Baccano!–something I had difficulty getting into back when it was new. (We wrote about it briefly here, here, here, and here.) Given how high the acclaim for it was once it ended, I admit it’s a show I probably didn’t give the chance it deserved. The multi-character introductions simply confused me at the time. I’ll go back to Baccano! in a different time. Did the successor give me a better first impression? Yes, for the most part. Instead of seeing gangsters in Prohibition-era America, we have hipster teens in Ikebukuro. The character introductions are paced more deliberately, shown in groups rather than as scattered individuals all over the place. It’s easier to see the connecting threads between, say, Mikado and his buddies and the situation with the headless rider. 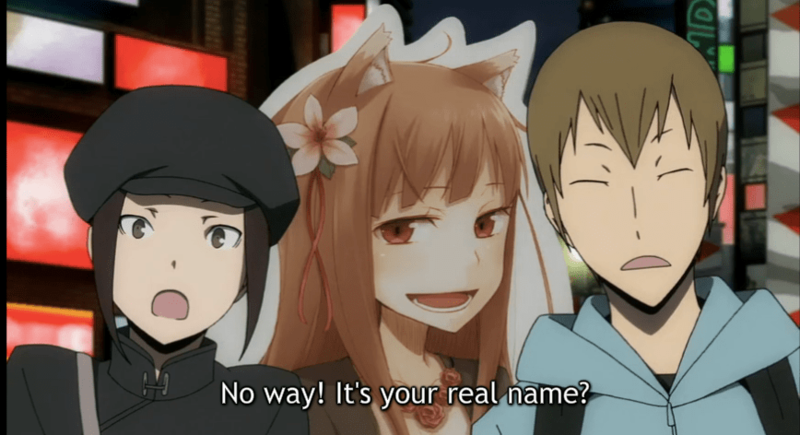 (I’m not sure what Horo from Spice and Wolf is doing there, exactly, in cardboard effigy form.) I watched Durarara!! immediately after watching Baka to Test and the tonal shift was immediately apparent: this is going to be a bit more realistic, a bit more actiony, a bit darker. With some well-animated backdrops of nighttime Tokyo, and terrific battle sequences, this show screams ambition and promises to be more exciting–and more cool–than anything else I’ve watched so far. This is a show I missed from the previews and thus had no idea what it was about when I watched it. This show is apparently based on a PSP game created by the maker of Higurashi and Umineko and that fact is immediately obvious in this initial setup: small rural town with mysterious traditions, collective amnesia, old town threatened by development, and a potentially scary festival. Apparently it’s even set in 1983, just like Higurashi. Given its pedigree, I’m inclined to give this show the benefit of the doubt, though so far it’s not as promising as either of the previous two adaptations right now. It seems to be heading more in an action rather than horror or mystery direction, and it seems to be showing its hand a bit too early, giving the audience too broad a hint in its first and last scenes as to what might be going on. I have no doubt that it could get much more complex later on, though how complex or lengthy its original source material is might limit its horizons. I guess the problem is that so much of what made Higurashi work for me was how successfully the atmosphere was built up, the sinister feeling that something is really, really wrong. The provided standard hints of it in this show seemed perfunctory, and not in the way the photographer in Higurashi simply tossed out the fact about the murders. Perhaps it’s a problem of direction as opposed to content. Good anime directing can make or break the feeling of a show, no matter how great the source. In either case, as with any of these kinds of shows it’s impossible to judge simply based on the first episode. An eye will be kept to see if it becomes worthy of its legacy. A year too late but THANK YOU, finally someone that had the same problems with Baccano! that I did and found Durarara!! much easier to get into. Durarara!! is excellent. I’m almost entirely caught up on the series. I should probably give Bacanno! another chance though. People who like it love it.